Middle Eastern and Mediterranean food shop on Cowley Road. Page last edited 2014-04-09 16:54:09 (version 2). 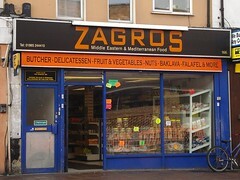 The frontage advertises "butcher, delicatessen, fruit & vegetables, nuts, baklava, falafel & more". Note: As of April 2014 this has closed. The premises are being refurbished as something called Beetroot. Last edited 2014-04-09 16:54:09 (version 2; diff). List all versions.